Cut garlic heads about 1/2-inch from the top to expose cloves. Place whole heads of garlic on individual flat pieces of foil paper on small sheet pan. Sprinkle with salt + pepper, drizzle with 2 tablespoons olive oil and wrap tightly. Transfer pan with garlic heads to preheated oven and roast until garlic is soft and caramelized, about 40 - 45 minutes. Remove from oven and allow to cool. Cut peeled potatoes in cubes and boil in broth/water in large heavy pot until tender. Drain well and place potatoes back in pot. 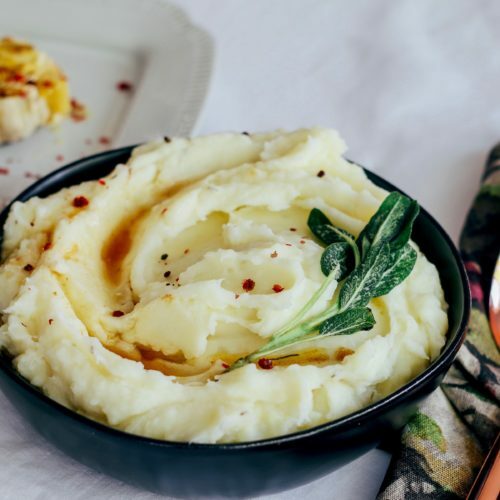 Add roasted garlic, 8 tablespoons of butter, 2 tablespoons olive oil, warm infused milk or ½ + ½, cheeses and salt + pepper to taste; whip or mash until creamy and smooth or desired texture. Add milk or cream with a couple of sprigs of rosemary (if using) to medium size saucepan and simmer. In a small saucepan over medium-high heat, melt 4 tablespoons butter. As soon as the foam subsides, reduce heat to medium and continue cooking the butter until it is brown but not smoking, about 2 to 3 minutes. Immediately remove from heat and set aside. In small skillet, heat remaining olive oil and flash fry a few sprigs of sage 30-40 seconds. Place on paper towel lined plate to drain. 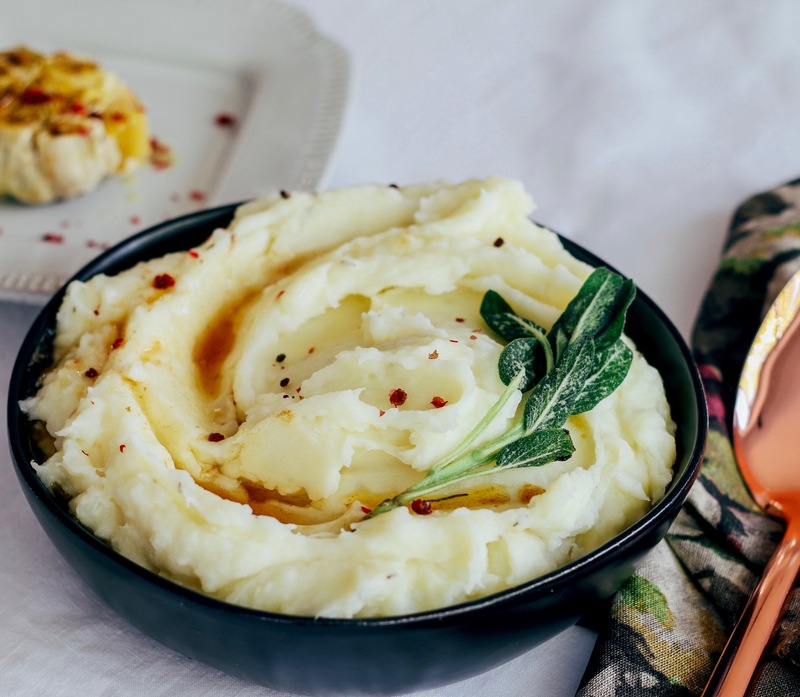 Remove leaves from stem and crumble over mashed potatoes or leave on stem.